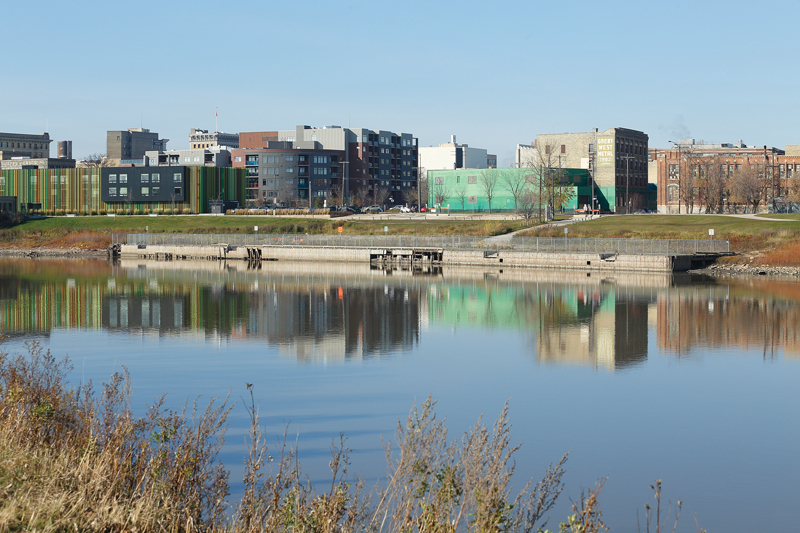 Winnipeg is nicknamed “River City,” but despite its centre being located at the conflux of two waterways, the reality is that the city’s waterfronts have long been neglected. Most modern metropolitan areas around the world orient themselves towards their waterways, and water-facing sites are generally sought-after real estate. There are numerous case studies of reactivated waterfronts that have yielded cultural and economic gains through public access. Winnipeg’s waterfront sites, in contrast, are often used as surface parking lots and industrial infrastructure. A view of the current state of the Alexander Docks, located on the Red River. The site is flanked by development along Waterfront Drive. Photo by Brian Gould. Our conviction that Winnipeg needs to rethink its relation to its rivers led the two of us to organize a community-based ideas competition in 2018. 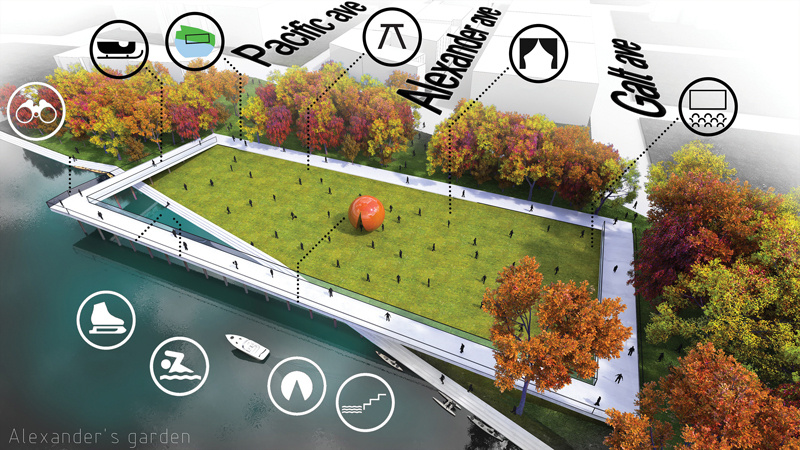 The intent of On the Docks was to involve citizens in exploring the urban potential of the abandoned Alexander Docks, a riverside site that is starting to be surrounded by developments. We asked the community a simple question: What type of public space would most benefit the site? Designers as well as non-designers were encouraged to dream big with imaginative solutions. Play of the Land, by Billy Chung of Toronto-based Something Specific, contrasts the Prairie horizon with an artificial landscape along the Red River’s edge. This continuous greenery extends the city fabric to the river with a year-round, activity-filled terrain. Along Waterfront Drive, the western bank of the Red River, the Alexander Docks was once a central hub for river traffic. The adjacent railway line and road networks provided easy access to the nearby Exchange District. As rails and roads expanded over the following decades, river traffic diminished. The wharf was closed in 2015. Now owned by the City of Winnipeg, the acre-large site remains fenced due to concerns over structural integrity and safety. Additionally, the site is also limited by erratic river levels, and the city water and hydro lines running underneath. With the revitalization of the Exchange District over the past decade, there is an increasing interest in living downtown, and with this comes the urgency to create more useful and enjoyable urban public spaces. The once-industrial Waterfront Drive has been rehabilitated to re-engage with our waterways and connect them to downtown, but the Alexander Docks remains as a key missing link. The Warf by Thomas Nuytten, Hélio Rodrigues, and Hugo Gonçalves of Winnipeg’s H5a Architecture was inspired by the North American Aboriginal medicine wheel. The program is curated to serve the mind (with an interpretive centre), heart (with a memorial), soul (with a contemplation area), and body (with fitness equipment and kayak lockers and rentals). In order to make the competition accessible to all, we provided an axonometric view of the site as a template, and asked the community to communicate their ideas through any means—drawing, collage, painting, writing. In two months, we received 200 submissions. Teachers used On the Docks as a classroom learning tool; nearby residents and businesses used it to express their views on development. We reached out beyond the city limits to architectural associations across Canada and to online forums, and received entries from around the world. A multidisciplinary jury panel was selected to reflect the community and bring perspectives from the realms of development, politics, design and culture. 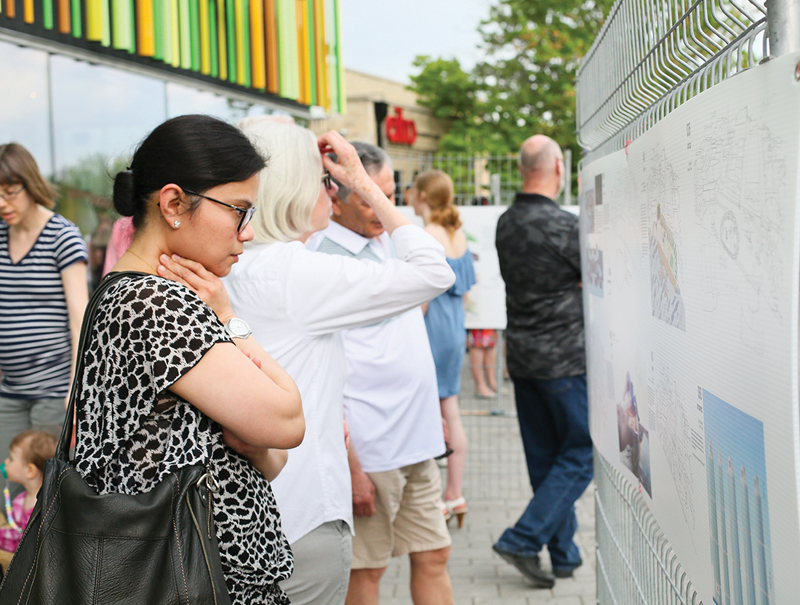 A travelling exhibition and public awards ceremony were among the competition’s community engagement elements. Photo by Jenny Yablonowski. The most successful aspect of the competition was its accessibility to everyone in the community. The submissions were varied and proposed a wide range of elements—from beaches, markets and pavilions, to Ferris wheels, Mars launch pads and amusement parks. 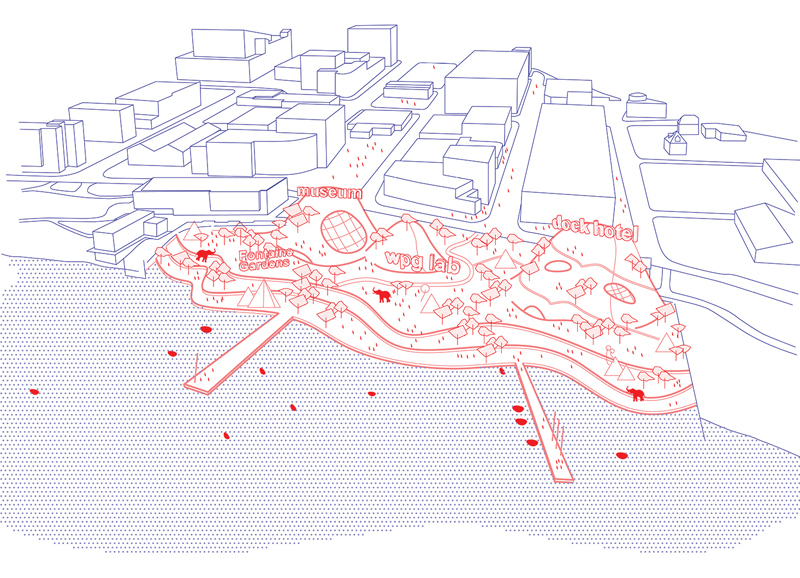 Most, however, expressed the need for truly public space—areas that are programmatically flexible with full access to the Red River. The competition made us wonder: how can we redefine public space to create a core support system for many uses? How can we push public spaces to perform better, responding with a built-in flexibility that accommodates activity and conversation? It’s clear that entrants were thinking beyond typical uses, pointing to the need for a broader approach to urban public developments. 15 Light Posts by Chinese designer Yuhan Wang was the competition’s second-place winner. 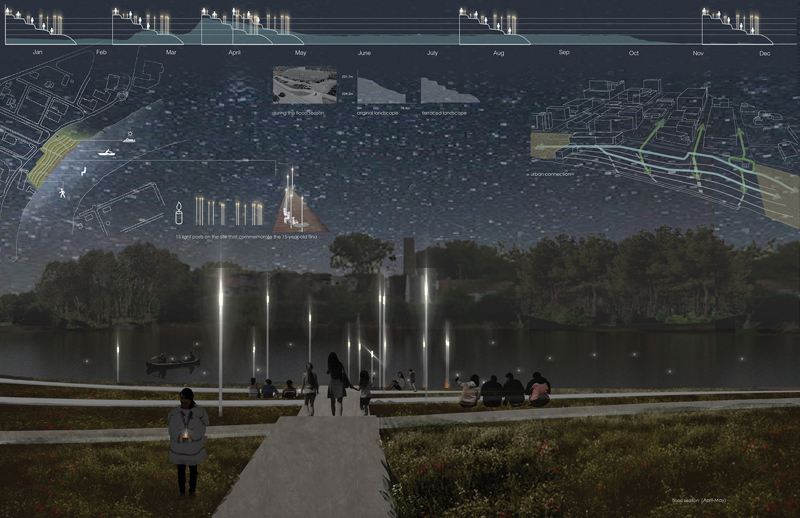 It proposes a resilient terraced landscape system that reacts to different water levels, with 15 light posts to commemorate the 15-year-old Tina Fontaine. The Alexander Docks is the site of the tragic discovery of the body of 15-year-old Tina Fontaine, which spurred the National Inquiry into Missing and Murdered Indigenous Women and Girls. Design responses reimagined the idea of memorials by proposing spaces for conversations, community centres, and various places for gathering and sharing—public spaces that celebrate all cultures and promote healing through reconciliation. The Alexander Docks has gained significant national exposure as a symbolic place for an important conversation happening in Canada today. We organized an awards evening that brought together city officials, designers and members of the community to discuss the future of the Alexander Docks. The conversation continued on social media and through a month-long exhibit displayed in various public places throughout Winnipeg. 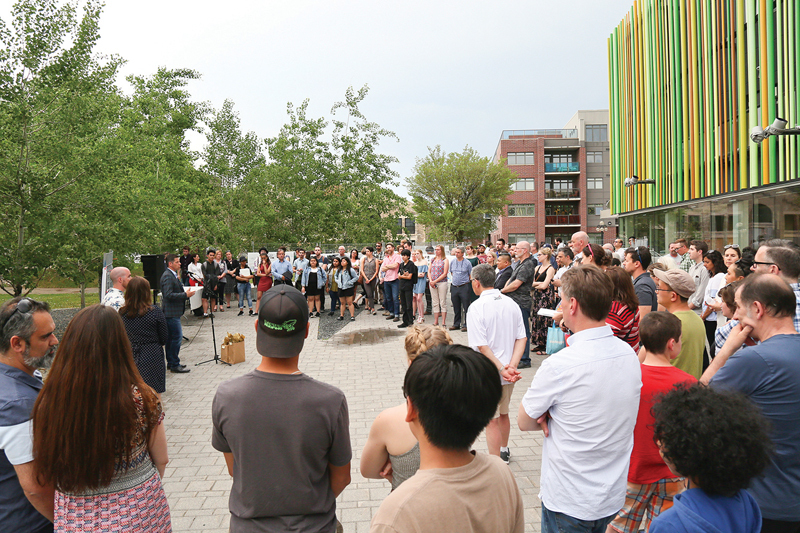 An event co-organized by On the Docks and Storefront Manitoba included presentations by students, teachers, designers, and university faculty, along with a panel of Winnipeg decision-makers. Throughout the process, the City of Winnipeg has supported the competition. The enthusiastic response to the competition inspired us to create a publication that summarizes the possibilities for moving forward. The competition’s first-place winner was Alexander’s Garden by Sabin Cornoiu of Romania. The project aims to create an egalitarian outdoor living room for the whole community in the middle of the forest, and a gateway for all-seasons access to cultural activities. 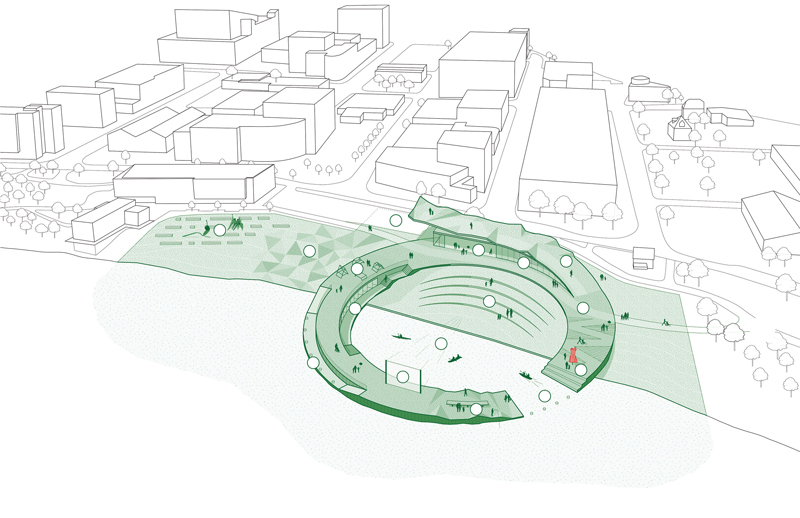 On the Docks has demonstrated that Winnipeg’s citizens see value in creating public spaces that engage the river. The site presents a complex layering of emotional, cultural and environmental issues. This complexity can yield dynamic and exciting design solutions, and On the Docks has helped create momentum within the community for a thoughtful approach to the site. The present renewal of the Exchange District and Waterfront Drive, along with the community’s efforts towards reconciliation, make this is the right time to move forward with a progressive new idea for the Alexander Docks site. Laurène Bachand and Aaron Pollock both work at Number TEN Architectural Group, and see opportunities in revitalizing spaces within cities by engaging with the community to uncover their latent potentials.